You and your employees spend the majority of the week in your office, so why not make your workspace a pleasant and stimulating place to be? If you’re working in a bland environment or an office that hasn’t been remodeled in the last three or four decades, why not upgrade to a new layout and design that will show off your business and inspire employees to achieve more? Remodeling your office makes good business sense. Studies have shown that your office layout and furniture choices—everything from the color of the walls to the chairs that your employees sit in—have a measurable impact on employee morale, cooperation, and productivity. Establish the right kind of business environment and you’ll improve daily operations and long-term goal attainment. In many cases, your Toronto office is also the first real impression that new clients and prospective job candidates have of your business. Maybe those clients or jobseekers checked out your website before coming in to meet with you, but entering your office is the first opportunity they have to really get a sense of your company culture. Show off an inviting space filled with satisfied employees and you’re more likely to recruit top talent. The best way to ensure that you establish the ideal office environment is to work with an experienced office design company in Toronto. Alliance Interiors specializes in designing and furnishing Toronto offices to meet both aesthetic and practical needs. 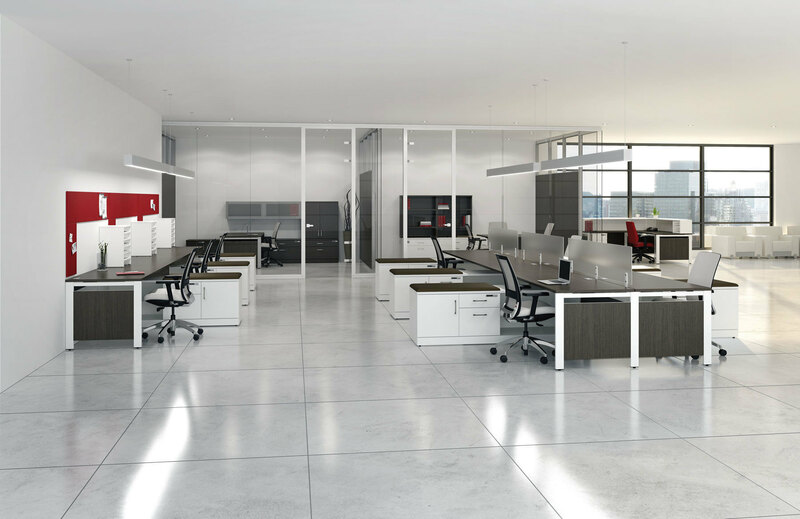 Our goal is to help you improve your work environment—and your office’s bottom line—without sacrificing elegance in design. Home Office Design: If you split your time between a corporate office and a home workspace, or if you spend most of your time working from home, we can help you create the perfect individualized work environment. Corporate Office Relocations: Shuffling employee seating, switching floors, or moving to an entirely different building? We’ll help you coordinate the move and set up the new office so that everything goes as smoothly as possible. Office Project Management: We know that coordinating a remodel on your own can be stressful, so we’ll give you greater peace of mind by reviewing your project requirements, going over your budget, and working with a designer to produce a full set of construction drawings. Office Space Planning: We’ll help you come up with a new layout to better promote creativity and communication between departments and teams. Office Furniture Procurement: We’ll help you choose new furniture and procure them from the high-quality vendors with whom we partner. Our brand partners offer top ergonomic, eco-friendly, and aesthetically appealing products to meet the needs and style of any Toronto office. All our partners are committed to creating furniture that both looks and feels great, and in many cases, we can even work with our partners to have your employees fitted for ergonomic desk chairs. We’ll help you go through these vendors to find the right products for your particular office and ensure that you receive your new furniture promptly. At Alliance Interiors, we believe in letting our clients lead the way. We’ll offer design guidance and recommendations, of course, but we want to make sure that you get the office you want, since this is the space where you and your employees will be spending the better part of your work week. When you contact us, we’ll set up an initial meeting so that we can discuss your needs and design preferences. We’ll also go over your budget so that we can make sure you get the space you want without breaking the bank. We’ll work through any concerns, such as the disruption to your business that a remodel could potentially cause, and find creative ways to overcome these obstacles. You can expect us to stick with you and be available to address questions and concerns throughout the redesign process. If your remodel requires any construction, we’ll provide construction drawings and send them to sub trades, who we’ll direct through the whole process to ensure high quality work. Client relations are important to us, and we hope you’ll give us the opportunity to show you the quality service and treatment we can provide. Want to Know More about Alliance Interiors? Call Us Today! Don’t feel obligated to hire us immediately after contacting us; we’re happy to answer your questions and give you time to think about whether working with Alliance Interiors is the right choice for your business at this time. However, we certainly hope that our reputation for excellent service and eye for value-added design will encourage you to work with us in the near future. Create the work environment you’ve always envisioned and let your office live up to its full potential; contact us today!